“Let’s start again. This is my friend, Maggie, owner of this wonderful bookstore.” The man in shorts spread out his arms. “I love the smell of books, don’t you? You’re right. My name is Zero, but how did you know?” He stroked the Big Ben watch face with a forefinger, one eye on his wrist and the other on her. “Settle down.” The woman in black bent over the table and deposited a tray of glasses and a bottle of brandy. “Sorry to hear that. Here. I brought you water. “You have a cat? I hear it, but where is it?” Lisa searched the floor. “Ow. My head.” Arms raised to grab a lopsided weight spiked to her head, Lisa resisted the urge to scream. Maggie cackled a crone’s laugh, holding her sides, spiked hair weaving. Eyes glazed, Zero bounced out of his chair to lend a hand. The cat hissed. He stepped back, shoved hands into his pockets. Blank-faced, Lisa’s eyes widened at the unexpected bundle dropped into her lap. “But— But— Mozart?” The white fur cloud stood on his hind legs, raised a paw and patted her cheek, then again with an unwavering stare, and again. His purr grew from a low whirr to a vibrating rumble. She hugged him. Front paws raised, she lifted his light frame like a baby. Head tucked over her shoulder he pushed his nose into her neck, purr steady and deep. “Have you come to take me home?” She drew a jagged breath, silver tears leaking though she blinked to stop them. “What am I saying? How did Mozart get here? How did I? “Watch what you say about Viper. He never took to you either. Brandy?” Maggie poured before anyone answered. Gripping a snifter, she took a large swallow and coughed. Zero thumped her between the shoulder blades. “That’s enough.” She took a smaller sip. Maggie passed her a snifter. “Do you believe in magic?” She searched the depths of her own glass before raising an elegant black brow. “You’re serious? No. I do not. That’s make-believe for kids and fairy tales.” Mozart continued to purr. She stroked his long silky fur with utmost care. Raising his head again, he patted her cheek and sighed. “What if I said magic is real? Would you believe me?” Eyes dark, voice humorless, she nodded swirling the glass, studying the gold liquid sway to her manipulation. “Do you? Can you send us home? Nervous, Zero sipped the liquor, ears flaming red. “Tell her about Nelda. Tell her.” He paced two steps forward and two steps back in the awkward space. Lips compressed, Maggie shook her head. Zero hooted. For a man with eyes a girl could drown in, he laughed like a donkey. Lisa’s jaw dropped. Mozart sat up blinking at him like an owl, one eye at a time. “What you call computers are extinct.” Maggie extended a wrist sporting a nautical-type watch similar to Zero’s. Observe. Poking dials and sketching shapes on the watch face with a forefinger, she pointed it towards the wall. A holographic map projected on the wall. “Wow. How did you do that? No laptops either? Zero dumped his snifter on the coffee table. I need air. Deal with it Maggie. Once and for all.” He hesitated, turned back, wearing a thoughtful expression. “Excuse me.” He directed an abrupt nod towards Lisa and fled. A deafening, protracted silence bounced around the mint green walls. Not even the familiar ticking of a clock echoed in the hush. Mozart licked a paw, cocked his head and chose another. Categories: #BlogBattle, books, Happy New Year, lifestyle, magic, secrets, spirits, surprise | Permalink. What makes you think you’ve leaped inside a story? Maggie stepped back, a smirk on her face. The man in shorts stopped pacing. His and Maggie’s gazes met. She snorted and retreated again, hands steepled as if in prayer. Lisa examined her black attire: Straight long dress, shoes and short, spiked hair. Cool hair. Fortish? Is she a witch? “What the heck is going on here?” Lisa squirmed in her seat, flinging the now empty glass back and forth. “More water, dear?” Maggie leaned in plucking the empty glass out of her grasp. “Sit tight. I’ll be back.” As if floating on air, she swept out of sight. “What’s that?” He stopped pacing and shook his head as if to clear it. Glancing over a shoulder, he caught both customers, bodies slanting forward, ears twitching. Lisa followed his stare. “Aren’t you two expected somewhere?” The tall one weighed the antique book in his hand raising his brows at his partner. She shrugged, returned her book to the shelf, and yanked his sleeve to do the same. Maggie materialized watching the exchange with a full glass of water dripping with condensation. Chins to chest, the pair skedaddled to the exit. “How.” She shot Maggie a look, raised the glass to study the clear liquid. “I’m done being polite. Will someone please answer my question?” Eyes shut tight Lisa stamped her feet where she sat, slopping water to her lap and the carpet, sending a tattered slipper into the air. Something passed between the two friends. He lifted the back of his wrist drawing circles with a forefinger on the watch face. “What a bizarre watch, or is that some new technology—Zero?” She concentrated on his reaction like a hawk. “I’ve had it two ye…” His head whipped up, a flush rising from neck, to face, to ears. Lisa’s mouth dropped flapping like a baby guppy. “Not necessary, because I’m… going home.” She yawned. “I’m so tired.” The woman led her to the back of the store, the man trailing behind them. Hours had passed. The cat refused to come out from under the bed. From the balcony, Mya checked the parking lot for her sister’s car. Right car. Right plates. Still there. Hungry, she peered into the fridge. Nothing but bread and eggs. Typical Lisa. The freezer however, had two store bought pizzas, a couple Ziploc bags of deli soup, a bottle of vodka, and two glasses. She grabbed a pizza, slapped it on the counter and turned on the oven. Dressed in a pale green dress identical to Maggie’s black one, Lisa folded her clothes and exited the bathroom. She dropped the bundle. A hoarse, mournful voice called her name. Lis-saaaaa. What’s going on here? Where are you-u-u? Hands clamped over her ears, she swayed and grit her teeth. “What is it?” Maggie gathered up the shirt and leggings. “Hair of some kind. Wrong color for you. Do you have a cat?” She made a roll of the clothes instead of refolding them and abandoned it in a kitchen chair. “I do. Mozart. He was curled on my lap when I…” Lisa rubbed her forehead. The white strand stuck to her head. “You’re okay now. Make yourself comfortable. I’ll call Zero.” She pushed Lisa towards the sitting room. Sticking an arm around the curtained doorway, she waved an invitation. “I mentioned Crow Lake, I believe. Don’t you remember?” Elbows on his knees, Zero edged to the front of the sofa chair. “February 29th, 2020,” he said. Maggie nodded. Categories: #BlogBattle, books, humor, lifestyle, mind, Short story | Tags: February 29th, reading cramming | Permalink. She snapped shut the laptop. It’s now or never. Lisa’s hand snaked toward her coffee mug. Book propped against the cat she slurped the hot liquid and turned to page one. Mozart raised his head, bumped against the offending nuisance. “Settle down.” The mug returned to the table, she moved the book closer soon lost in the story. The idea had been to pull up stakes long ago. Both still single, Zero and younger sister Nelda couldn’t agree how or when. They had been born in Crow Creek, but the population had dwindled from 100,000 to a quarter of that. The Zika virus had wiped out both parents and half their relatives. How does anyone leave them behind, alone with no one to visit their gravesites? The store window looked real. She squinted over her shoulder. Dozens of bicycles and riders whizzed by on the tree-lined street. Birds chirped. The air smelled clear as crystal mountain air. Not one motor vehicle in sight. Nothing but quiet as if someone had muted the sound on a movie set. Her sister’s persistent voice gave her a headache. I must be dreaming. She heard it too, but far away. A cat bawled and bawled. The ratty slippers were hers as were the red leggings and fleece man’s plaid shirt she’d picked up at the flea market. She had dressed for a cold February day that morning. Now the sun’s heat sent rivulets of perspiration everywhere. A bump against her elbow sent her stumbling. Lisa squeezed her eyes tight. This was real. It hurt. She massaged the tender spot. He leaned in, grabbed her shoulders, and steadied her. They were eyeball-to-eyeball. Blue-gray eyes searched hers. “Where am I? You can let go now.” She brushed invisible fluff off her shoulders and arms. Lips pursed, he let out a low chuckle. “Crow Creek.” Hands shoved into pant pockets he rocked forward and back. He made no secret of sizing her up, cooler then she by far in his T-shirt and tan shorts. “Aren’t you hot in that?” he said pointing with his chin. Lips pinched together like a lipstick-eaten hyphen, she glared at his chin, resisting the urge to look into those eyes. You’re enjoying this far too much. “Do you?” She poked an index finger not quite to his chest. “Manners, manners. You want help. Be nice.” He toed the cement walk. She moved closer to the shop wall into the shade. “Mozart. Where’s my sister?” Mya leaned forward. He backed away, yowled and flew down the hall to the bedroom. “Lisa?” She checked the rooms one by one. The bathroom door open proved empty as well. Something caught her attention. The laptop lay closed on the sofa table. Closed. Closed? She scrutinized the living room and the Easy-boy: the forever stack of books, a mug of cold coffee and a book face down on the carpet. Odd. No trace of Lisa, though. “Everything okay in here?” The super hovered in the doorway, changing feet, a frown chiselled on his face. Lisa rubbed her temples. Her sister’s voice called and called from some distance. The buzzing in her ears sounded like a hornet’s nest. Hot. So hot. “Water. Is there water around here?” Eyes closed, she leaned against the shop wall. Arm around her shoulder, he helped her inside the store. “Maggie. A tall glass of water please?” He nodded at the couple customers who turned in curiosity. The bookstore owner placed a cool damp glass into her hand where she sat in the armchair on the far side of the counter. “Anything else I can do for you?” The man drifted in and out of her vision behind the Maggie character. Categories: #BlogBattle, books, humor, lifestyle, Short story, slippers, surprise | Tags: drama | Permalink. I tossed and turned, but sleep eluded me. A quivering shadow snaked past the window without crunching footfall. An owl hooted. As I rose in the dark, the front door exploded. Books and debris battered the walls and floor. Knick-knacks smashed and glass shattered. I dove beneath the covers. Breath ragged and muscles cramped, sweat shot out of my every pore. I smelled bad. I’d once heard this cottage was haunted but— A Halloween trick, then? The door slammed shut. Hair drenched, I peeked out and gasped air. Flashlight beams flickered about. 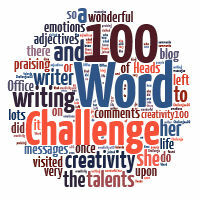 Categories: 100-Word Challenge, books | Tags: books, shadow, sleep, who | Permalink. Are you still scrambling, as am I, checking off lists and / or scratching your head? Are you in a panic for that one stocking stuffer—something unexpected and special—the icing on the cake? What the heck do you get Aunt Mary, or Betsy, or Uncle Phil? They have everything, right? I would like to make a suggestion. First of all, sit down and take a deep breath. Feel better? I thought you might. I do not have a crystal ball and anyway, I wouldn’t know what to do with it. I’d likely drop and break it before I learned to read the messages within, but YOU can work some magic. It is no mystery I am proud to suggest you click on over to http://redmundpro.com/book-store/ftp5/ and order copies of any one or all of the sizzling Flash Anthologies you’ll find at your fingertips. Hurry. Time’s a-wasting and Christmas will not wait. Give the gift of laughter, bewilderment and surprise: small morsels wrapped inside as few as 50 and as many as only 150 words. Go. Make your favorite people happy. If you wish to buy flash ebooks, use the code GIMME10 for 10% off through this month. Don’t forget #1 is always free. OF SPECIAL NOTE: Many of the authors of these anthologies donate their payments to MAGIC Foundation. http://magicfoundation.org which works around the world with children with growth and genetic disorders. True, yes? Hurry while there is time. Check the right-hand bar on this page for a preview of all the lovely covers. There are now five to choose from. Get them all. The latest is Finding the Path, but don’t stop there. Categories: books, Christmas, family, lifestyle | Tags: books, celebration, Christmas, Flash in the Pan, The M3 Blog | Permalink. When you need help, who do you turn to? The natural response might be a friend. Friends don’t always have experience in the help you need, although they mean well. Then there are DIY manuals with instructions. They read like guidebooks: dry and tedious. I read a book last weekend I wish had been available two-and- a-half years ago. I wish I’d had it to turn to then, but it is available now, and everyone should read it. 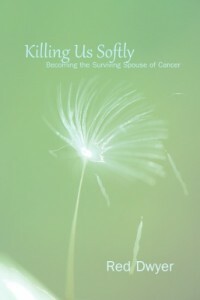 She writes with reflection and directness about her own experiences when cancer arrived uninvited into her household, took over her life, and stole her husband’s. She explains the best ways to handle circumstances you cannot avoid and how to preserve precious energy as best you can. This is not a handbook but a chronicle of an insurmountable life experience shared with the Reader: this is what happened; these were the difficulties; for best results this is what works. Honest. Direct. Exact. Red Dwyer is a no-nonsense sharer of truths. Killing Us Softly is divided into segments which are easy to understand. If you wish to flip through the chapters to choose any particular section, all the information is arranged in an easy-to-follow layout. Or, like me, you can read this informative book from cover to cover in two sittings. Anyone who reads it will gain indispensable facts from between these covers. I tried to stop after a couple of chapters but I became so caught up in the writing, I couldn’t put the book down until the end. The author doesn’t collapse under the weight of her undertaking; she intends to celebrate her and her husband’s married life together until the end. She creates memories—happy ones—for her husband, her family, and for herself. How does anyone do that under the circumstances? How does anyone manage a large family, tend to her husband, research his illness, write and create happy memories too? The words of wisdom interwoven in the story: what works and what doesn’t, are worth the read alone. Emotional reactions, doubts, confusion in an alien world all need to be addressed. Red Dwyer has lived all of those situations and shares her experience in a straightforward manner. I highly recommend this read. Check it out; you won’t regret the time well-spent. Red Dwyer is also the Promoter, Publicist, and Publisher of Redmund Productions and the blogger at http://TheM3Blog.com. Categories: books, family, lifestyle, Review, women | Tags: TheM3Blog.com | Permalink.